This example shows how to use binary integer programming to solve the classic traveling salesman problem. This problem involves finding the shortest closed tour (path) through a set of stops (cities). In this case there are 200 stops, but you can easily change the nStops variable to get a different problem size. You'll solve the initial problem and see that the solution has subtours. This means the optimal solution found doesn't give one continuous path through all the points, but instead has several disconnected loops. You'll then use an iterative process of determining the subtours, adding constraints, and rerunning the optimization until the subtours are eliminated. 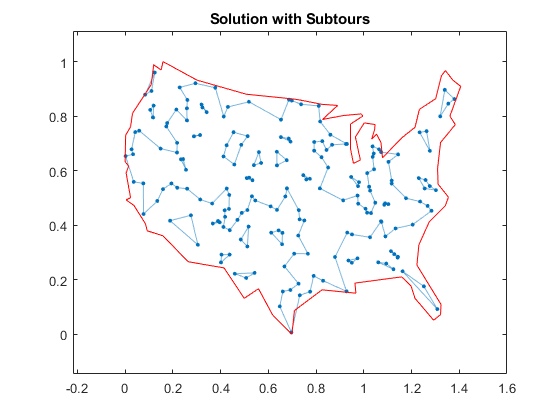 For the solver-based approach to this problem, see Traveling Salesman Problem: Solver-Based. 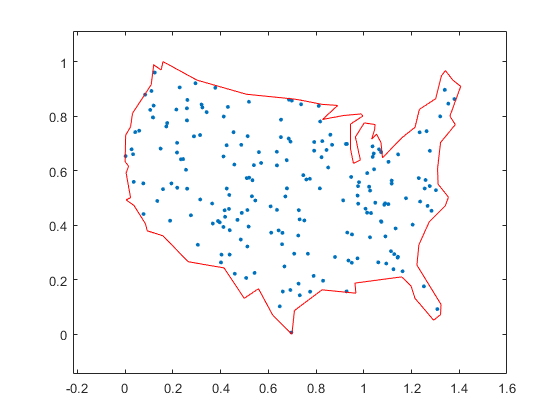 Generate random stops inside a crude polygonal representation of the continental U.S. Generate all possible trips, meaning all distinct pairs of stops. Calculate the distance for each trip. The cost function to minimize is the sum of the trip distances for each trip in the tour. The decision variables are binary, and associated with each trip, where each 1 represents a trip that exists on the tour, and each 0 represents a trip that is not on the tour. To ensure that the tour includes every stop, include the linear constraint that each stop is on exactly two trips. This means one arrival and one departure from the stop. Because there are 200 stops, there are 19,900 trips, meaning 19,900 binary variables (# variables = 200 choose 2). Generate all the trips, meaning all pairs of stops. Calculate all the trip distances, assuming that the earth is flat in order to use the Pythagorean rule. where trips is the binary vector representing the trips that the solution takes. This is the distance of a tour that you try to minimize. Create a problem and binary variables. Include the objective function in the problem. The problem has two types of equality constraints. The first enforces that there must be 200 trips total. The second enforces that each stop must have two trips attached to it (there must be a trip to each stop and a trip departing each stop). Specify the first type of equality constraint, that you must have nStops trips, and include it in the problem. To specify the second type of equality constraint, that there needs to be two trips attached to each stop, find the trips for each stop and add up the number of trips for that stop. Look at trips that both start and end at that stop. The problem is ready to be solved. To suppress iterative output, turn off the default display. As can be seen on the map, the solution has several subtours. The constraints specified so far do not prevent these subtours from happening. In order to prevent any possible subtour from happening, you would need an incredibly large number of inequality constraints. Because you can't add all of the subtour constraints, take an iterative approach. 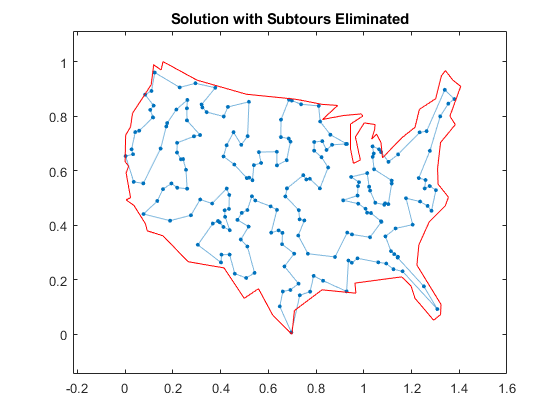 Detect the subtours in the current solution, then add inequality constraints to prevent those particular subtours from happening. By doing this, you find a suitable tour in a few iterations. Eliminate subtours with inequality constraints. An example of how this works is if you have five points in a subtour, then you have five lines connecting those points to create the subtour. Eliminate this subtour by implementing an inequality constraint to say there must be less than or equal to four lines between these five points. Even more, find all lines between these five points, and constrain the solution not to have more than four of these lines present. This is a correct constraint because if five or more of the lines existed in a solution, then the solution would have a subtour (a graph with n nodes and n edges always contains a cycle). The detectSubtours function analyzes the solution and returns a cell array of vectors. Each vector in the cell array contains the stops involved in that particular subtour. Include the linear inequality constraints to eliminate subtours, and repeatedly call the solver, until just one subtour remains. %         that subtour and all subtours that use those stops. % How many subtours this time? The solution represents a feasible tour, because it is a single closed loop. But is it a minimal-cost tour? One way to find out is to examine the output structure. The smallness of the absolute gap implies that the solution is either optimal or has a total length that is close to optimal.